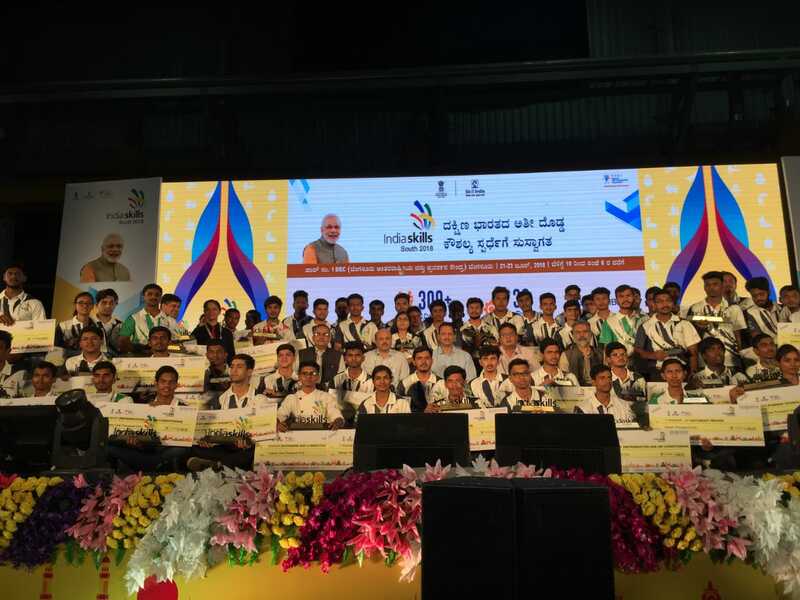 After 3-days of great display of passion and grit, the Southern Chapter of IndiaSkills Regional Competitions 2018 concluded today in a grand ceremony, held at BIEC - Bengaluru International Exhibition Centre (BIEC), Bengaluru. The regional finale was graced by the august presence of Anantkumar Hegde, Minister of State for Ministry of Skill Development & Entrepreneurship (MSDE), Government of India, Dr. K. P. Krishnan, Secretary, MSDE, Rajesh Agrawal, Joint Secretary, MSDE, Jayant Krishna, ED & COO, NSDC along with other dignitaries from industry and central and state government. More than 300 competitors from 14 states competed in one of the biggest skill competitions in the region. Organized between 21st to 23rd June, the competition was spread across 7 locations in the city, with BIEC hosting 25 out of 36 competitions. For the first time in the regionals, skill competitions were organized in unique trades such as Floristry, Print Media Technology, Landscape Gardening, Industrial Control, Aircraft Maintenance among others. The event also witnessed a lot of competitors breaking stereotypes by participating in non-conventional trades, e.g. a male competitor from Jammu & Kashmir participated in Beauty Therapy and a female competitor participated in the competition for Plastering & Dry Wall skill. Karnataka won the highest number of first positions at the event (11), followed by Kerala (6) and Andhra Pradesh (4). The winners were felicitated by Anantkumar Hegde, Minister of State for Skill Development & Entrepreneurship, Government of India. “I am proud to see large number of competitors breaking the conventional stereotypes and are showcasing their talent through this unique platform. I am sure the confidence that all of them gain through this event will help them contribute significantly to the growth of our country. Our journey for WorldSkills 2019 has begun and I am confident that our youth will make India proud at this event”, he further added. 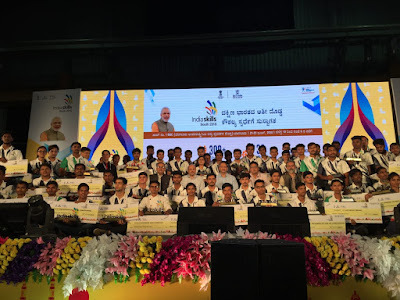 IndiaSkills competition, organized by National Skill Development Corporation (NSDC) under the aegis of the Ministry of Skill Development and Entrepreneurship (MSDE), has brought together 50+ corporates and academic institutes, along with 22 state governments all with one vision of making India the skill capital of the world. Leading corporate like Toyota, Maruti, Tata Motors, Festo, VLCC, Future Group, Schneider Electric, Hindustan Aeronautic Limited among others, have partnered Skill India Mission for this unique initiative. Since April this year, 500+ district and state level competitions have been organized across India. The southern chapter of IndiaSkills regional competition is the third in line of four such competitions across the country. The next regional competition for the eastern region is scheduled in Bhubaneshwar, Odisha from 15th to 17th July 2018. The winners from these regional competitions will compete at the National Competition at New Delhi in September 2018, where the final winners will get a chance to undergo best in class industry training and represent India at WorldSkills International Competition 2019 in Kazan Russia. India won 1 Silver, 1 Bronze and 9 Medallion of Excellence and ranked 19 among 56 countries at the last WorldSkills 2017 in Abu Dhabi. More than 1300 competitors competed in 51 skills at this event.